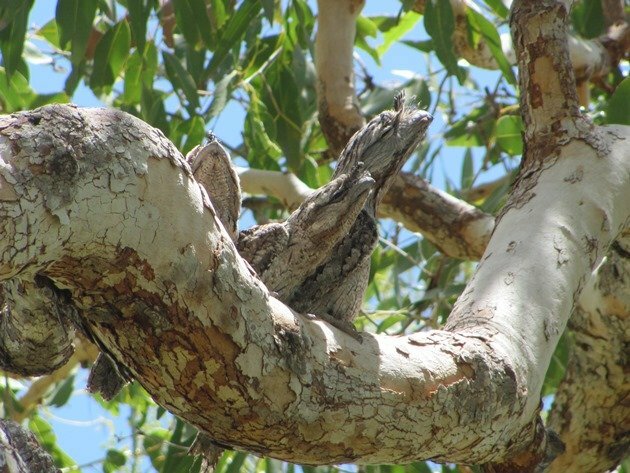 A few weeks ago I told you about our discovery of a Tawny Frogmouth nest near Ellendale Rest Area and we were wondering what became of it. It made sense to go and have a look! It is only 309 kilometres (192 miles) away and it is still another 87 kilometres (54 miles) before we reach our next town going north, which is Fitzroy Crossing. This is a remote part of Australia and distances can soon be covered, though on this journey north on 29th January we did encounter eleven sections of the main highway that had gone under water at creeks between Broome and Fitzroy Crossing. The water was shallow and we continued north, but we were prepared in case we got stopped by rising flood waters. The main highway is the only highway, so you do need to keep check of the road conditions. Shortly after we left home on 29th January the main highway south from Broome was closed due to the formation of Cyclone Stan further down the coast and we hoped that the system would pull the wet weather in that direction. Our rain can be very isolated at this time of year and fall in between every rain gauge in the north of Western Australia and it can be very hard to get a true indication as to how much rain has been falling into river catchments and therefore flooding the road. 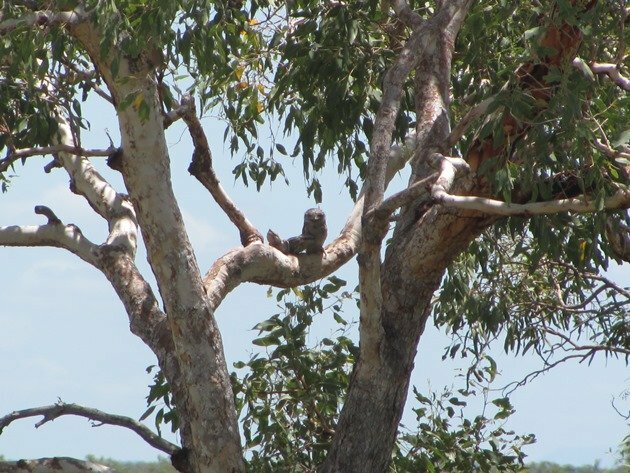 We arrived at the site of the Tawny Frogmouth nest site at 2:40pm on 29th January and we were delighted to see there was a Tawny Frogmouth still in the tree. 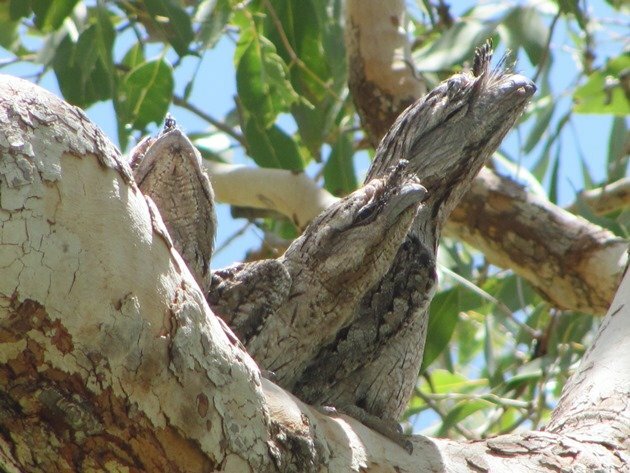 We were even more delighted when we discovered there were also two rather large juvenile Tawny Frogmouths cuddled up on the branch too! 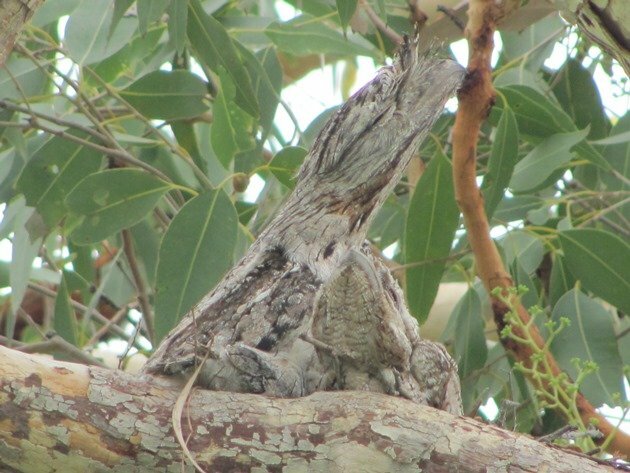 We could not even see if any of the few sticks that made the nest still remained in place, but the young Tawny Frogmouths soon took on the pose of their parent and went into cryptic camouflage pretending to be part of the tree! 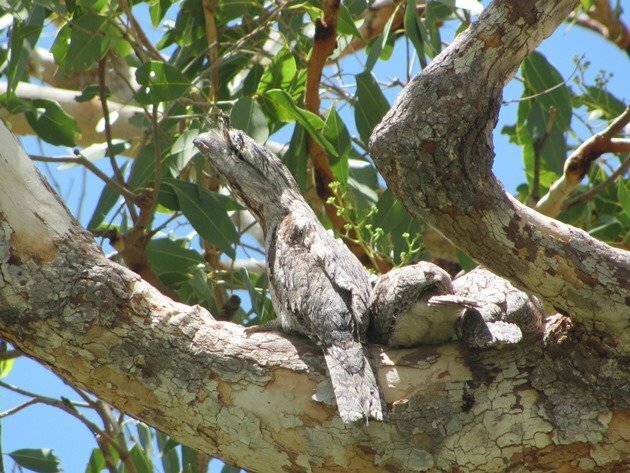 The young Tawny Frogmouths were facing in opposite directions and it was quite hard to make them out! The surrounding flowering gums were in full flower and offered excellent opportunities to observe Varied Lorikeets and Banded Honeyeaters. Our plan was to then head north and camp at the Ngumban Cliffs Rest Area that evening and continue north. It is an odd time of year to travel in the Kimberley, especially with a tent, but we had the opportunity to experience the flooded lands and the different birds that make the area home at this time of year. The Rest Areas offer shelter and you can easily erect a small tent up under the shelter and refrain from adding the outer waterproof cover, so you can at least keep the temperature in your tent around 29c (84f) overnight. This may seem like pure madness, but the temperatures were cooler than when we were in Marble Bar in November! 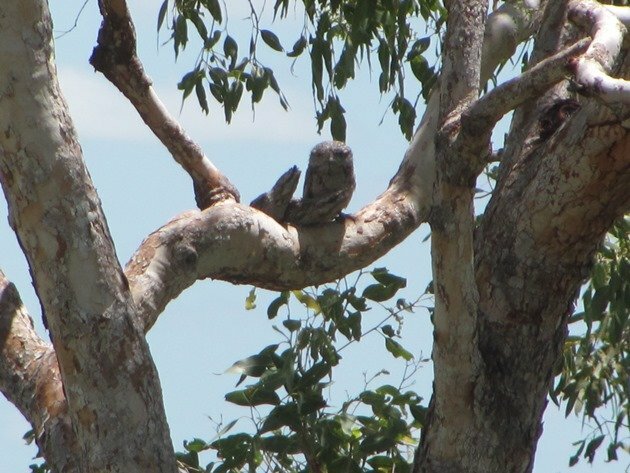 OK, madness aside, we had an amazing trip travelling north as far as Timber Creek in the Northern Territory and returned to the Tawny Frogmouth tree one week later on 5th February. It is amazing how much growth can happen in a week! It is lovely to see such beautiful birds in such a lush green environment at this time of year. 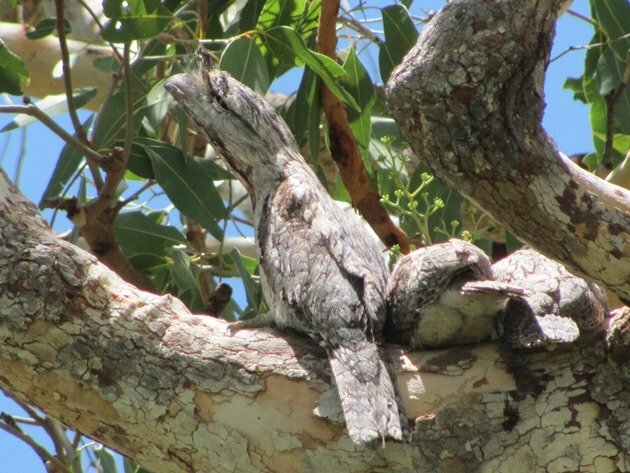 As we walked back to our vehicle the adult Tawny Frogmouth returned to her normal “owl-like” shape, but the young were not yet convinced and remained in their cryptic pose! It really is “off season” in the north of Australia at this time of year, but that should not deter you from exploring or going birding. You will be restricted to the bitumen and you may get delayed by flooded creeks closing the highway, but the birds are often right beside the highway anyway! It is like driving through a wetland! 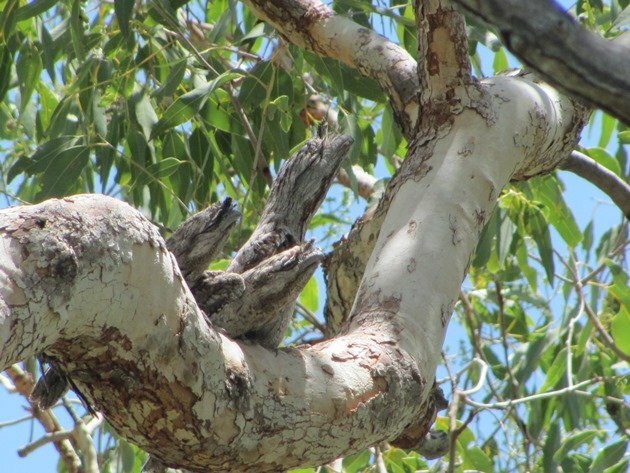 Of course it is handy if you know where a Tawny Frogmouth has put a nest if you want to see some young Tawny Frogmouths! Amazing! 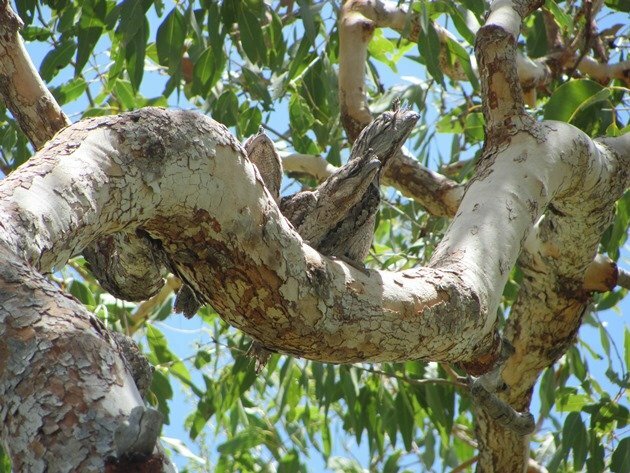 That’s some of the best camouflage I’ve ever seen. Thanks, Clare, for sharing these amazing photos. 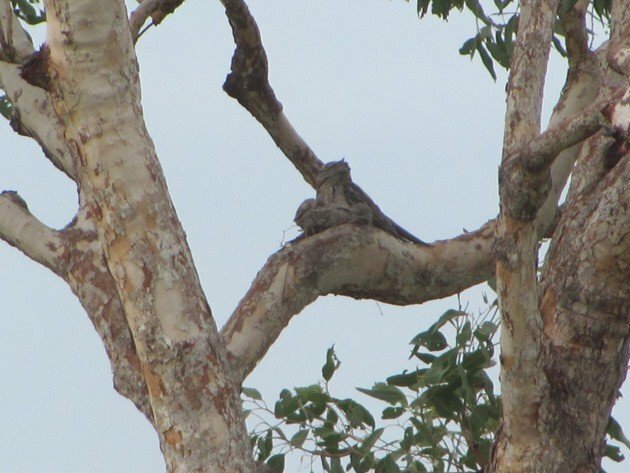 Several years ago we were shown a Papuan Frogmouth siting on a nest over the Daintree River. Never would have seen her ourselves as she blended in so well. Glad you made that short little trip back out to document the family! 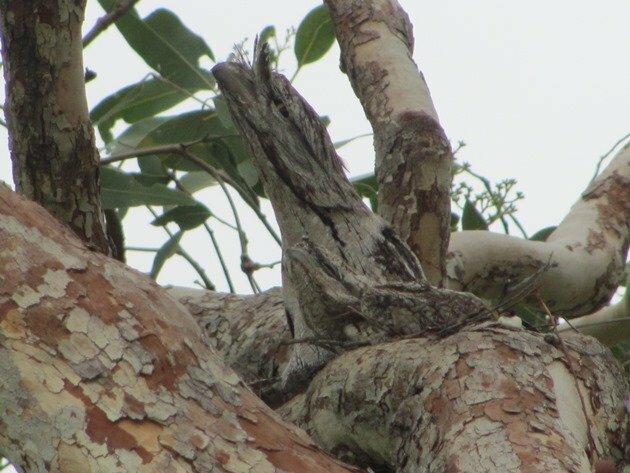 Win a Birdwatching Adventure in Peru!